Three candidates, namely SHANNAN MOON, JOHN FOSTER and BILL SMETHERS, are running for Nevada County Sheriff in our upcoming June ’18 Primary. PASCALE FUSSHOELLER of Yuba Net moderated this very well attended debate by asking each of these candidates many relevant and penetrating questions. There was much these three candidates agreed upon. 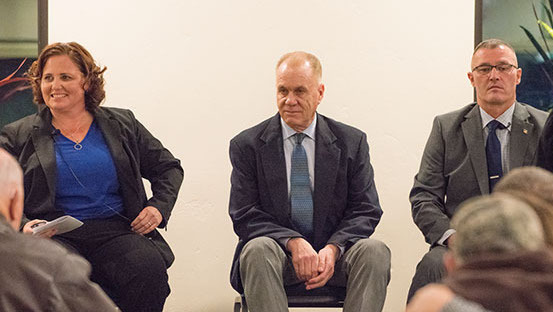 All three believe proper supervision, discipline, transparency and accountability, as well as outreach to the community, are fundamental to developing trust in the community and to having an effective Sheriff’s Office. They are committed to strictly upholding and enforcing California law including strict guns laws and Gun Violence Restraining Orders, etc. All agreed the Nevada County Sheriff’s Office (NCSO) must timely recognize when the law changes and immediately change policies and practices to be in compliance. Regarding cannabis, all three felt their focus should be on crime, cartel grows, and educating other growers about the legal requirements. As pertains to undocumented immigrants and ICE, they know NSCO lacks funds to participate in ICE efforts. All will comply with California law and value and protect the undocumented so that they will trust local law enforcement and come forward with issues. All want bodycams on all on duty officers. They are presently lacking and need to be funded. Regarding civil asset forfeiture, lawful procedures, coordinated with the District Attorney after a conviction, must be adhered to. In dealing with the disabled, the mentally ill and the homeless, all agreed that officers need more training, especially concerning how to de-escalate situations, but had some differences on how to otherwise deal with these populations. MRAP vehicles are considered valuable, free tools from the Federal government, made less offensive by being painted white. They agreed the community needs to be educated to see them as rescue, not military vehicles. All expressed a need for more funding for NCSO. The following summarizes how the candidates presented themselves and differed, in order of their appearance. Ms. Moon, born and raised in Nevada County, is a proven Commander of every NCSO Division over the 27 years she has worked there. She is the first woman promoted to Sergeant, Lieutenant and Captain in its history. She cares about the community and understands the issues. She feels she is the most qualified to lead and intends to be transformational if elected. Ms. Moon wants to restore trust and partnership between the NCSO and the community and has a strategic plan based on compassionate but firm law enforcement. “We need to listen to and see the impact of our policies while upholding the law. We need a strategy about where we are headed and how to get there,” she said. Her goal is to shift NCSO resources to criminal investigations and focus on protecting victims and recovering property. “We need to make sure resources are allocated to the right problem,” she said. Shannon Moon wants to be Sheriff because she feels that she can provide decisive leadership based on her knowledge and understanding of the scope of responsibility of the job. Mr. Foster has served in law enforcement for 35 years, 27 years in senior executive leadership positions including 17 years as Police Chief for the City of Grass Valley. He is well educated with degrees in Criminal Justice (BA-CSU-Sac) and Public Administration (MA-USF) and has taken professional courses with the FBI and Department of Justice. He has been honored by a range of respected institutions for his work and has served on numerous committees, councils, boards, associations and task forces. Mr. Foster knows how to positively change a culture of a police department while gaining the respect of those who work with him. He has an inclusive community service focused leadership style that reflects respect, courtesy and fairness. He is dedicated to helping youth because he feels it is crucial to crime prevention. He has formulated a time tested strategic plan to keep schools safe and plans to implement the Neighborhood Policing Initiative. If elected, he will form a Sheriff’s Advisory Board comprised of a diverse cross-section of the community to advise NCSO on neighborhood issues or concerns. Mr. Foster finds that accountability requires organizational and needs assessments, enactment of best practices and strategic allocation of resources including obtaining, if needed, grants or bids with other counties to provide services and produce income. Funding generally remains a problem even when more recruitment, hiring, training and other support is necessary. The Board of Supervisors controls NCSO’s budget. With community support, he emphasized the need to go to the Board and timely advise them with specificity of the situation and the amount needed to correct it. If necessary, NCSO should work with the Board to get a measure on the ballot to get more funding. John Foster has the experience of making effective decisions, policies and budgets while engendering respect and compliance. To his mind, these are the kinds of leadership experience needed in a Sheriff. Mr. Smethers, presently an executive Lieutenant of NCSO, has 24 years of experience in law enforcement in a variety of capacities. He knows how to restore partnership with the community by focusing on how we engage, what tactics are used and the quality of service provided. “It is essential that we work together because our resources are limited. We must listen to and collaborate with the community to be effective.” Although he previously served on the Marijuana Abatement as well as the Narcotic Task Forces, he will enforce the current cannabis law but with a quality of life focus for the growers and the community, given his experience that large grows have often caused problems in the past. “We need to rebuild relationships with growers and set clear guidelines for them.” he said. He suggested that money previously allocated to marijuana abatement be used to address other major current issues. Mr. Smethers thinks he possesses many important qualifications that are needed to perform the job of Sheriff. First, he has wide experience and knowledge of the job and its huge range of responsibility. Second, he values accountability, integrity and transparency. Even tho’ I was at the Forum, it’s great seeing a condensation of the evening and positions of the candidates in print. Hopefully we can do this for more races – for as many as possible.